Nobody wants to endure emergencies, but unfortunately, they’re a fact of life. You never know when they’ll strike so it’s best to be prepared, even when it comes to your mouth, teeth and gums. Why? Nothing is immune to the possibility of something bad happening, which is why your dentist will weigh in with information on how to determine whether you have a dental emergency and what to do. Read on to learn about situations that require immediate care. Take a Deep Breath – Although it may sound cliché, it’s important to not panic doing an emergent situation. One of the main reasons is that every second counts. Thus, a panicked response could cost you valuable time that could be better spent taking active steps to stabilize the situation. Contact Your Emergency Dentist – After you take a deep breath, then reach out to your dentist’s office to explain the problem. You may want to have a pen handy so that you can notate any special instructions that you may be given. 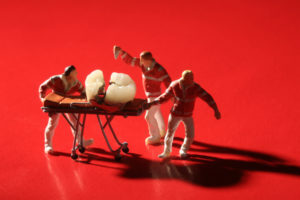 Let’s now take a look at some of the situations that classify as dental emergencies. If your tooth is knocked out, be sure to clean your hands, grab the tooth by the crown (the wider part) and carefully reinsert it in its normal place. You may experience some sensitivity if your tooth is broken, which will usually subside in about 24 hours, as the healing properties in your saliva cause the tooth’s enamel (the outer surface) to fortify itself. This will buy you a little time until you can be seen by your dentist. If you have a toothache, you may experience facial swelling and intense pain, both responses from a severe infection. You can take ibuprofen to lessen the pain and apply ice to the outside of your face to decrease the swelling. If you recently had a dental procedure done or have suffered a cut to the soft tissue in your mouth, you may have intense bleeding. Make sure to keep your head elevated, and if the flow of blood doesn’t lessen, head to the emergency room. You could suffer sudden trauma to the face while participating in sports or from a fall. If you experience intense pain, there’s a chance that your jaw could be broken, and you should immediately head to your local emergency room. The main goal, of course, is to avoid emergency dental situations as best as possible, but should one occur, you now have some protocols to follow to ensure that you can soon return to your normal, healthy state. Dr. Nelson Y. Howard graduated from the UCLA School of Dentistry in 1986, and since then has remained committed to providing his patients with the highest level of compassionate and expert care, which is why he’s completed thousands of hours of continuing education training over his 30+ year career. Dr. Howard can be reached for more information through his website.